Delivery of orders take place as per the business’s specified available days. There are certain dates when you do not take up deliveries of items/products due to public holidays or festive holidays. You would like these dates to be disabled on the delivery calendar so that selection of those dates is restricted for the customers. This is possible by adding Holiday settings to better serve your customers. You should keep your customers pre-informed of the dates when you do not carry out deliveries so that they avoid selecting a date on the checkout and realise the delivery will not take place. This is bad customer service and we will see how Order Delivery Date Lite for WooCommerce plugin helps you avoid such situations. Let us understand this by taking an instance. Say you run a florist business and your shop is closed for Christmas, hence no deliveries can take place on that day. So you want 25th December disabled on the delivery calendar to avoid selection of this date by the customer. 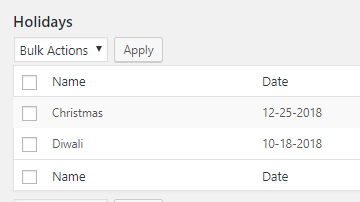 The first field on Add Holiday page under Holidays tab is Name. This name is a label for the holiday dates which will help the customers to identify the disabled days in the calendar. So if your shop is closed for Christmas then you can set the holiday name as Christmas. Note – You can also set the holiday name as Shop Closed if its closed for any random reason or name it as Public Holiday if it is closed for the same. Thus holiday name will help customer to identify when the delivery of goods will not take place and its reason for no delivery. 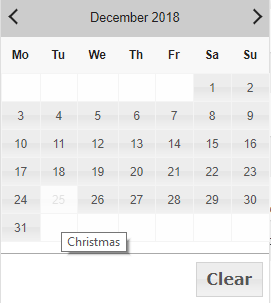 This is a free version and therefore you can select only one date at a time for adding holidays. 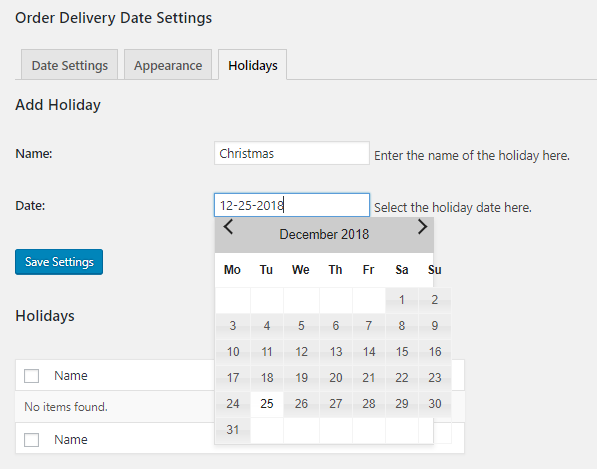 If you want to set up range of dates for displaying consecutive days as holidays then you can try our Pro version of Order Delivery Date plugin. Once both these fields are added, save these settings by clicking the Save Settings button. Here there is a provision to perform bulk action for deleting these holidays. For this you add one more holiday for understanding this functionality better. Click on Apply button once you select Delete from Bulk Actions drop down. Both your holidays will be deleted in one go. This functionality is useful for deleting bulk entries. 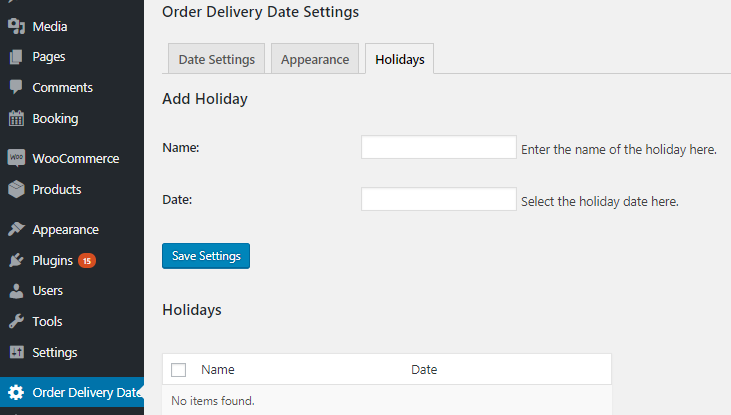 This feature is useful for the business where order deliveries do not take place place due to declared holidays like public holidays, festive season or any random reason. You can serve your customers better by using this functionality as they are well informed about the delivery schedule of your shop which in turn will restrict your them to place orders for those specific holiday dates and avoid any hassles.